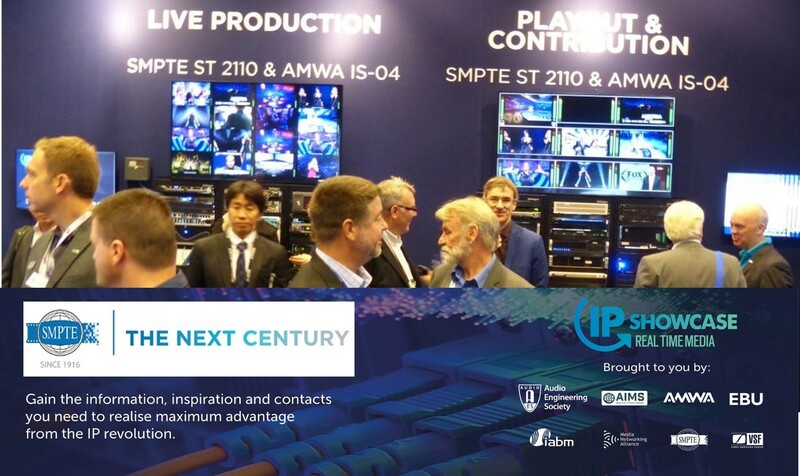 SMPTE announced the approval of the first standards within SMPTE ST 2110, Professional Media Over Managed IP Networks, a new standards suite that specifies the carriage, synchronization, and description of separate elementary essence streams over professional internet protocol (IP) networks in real-time for the purposes of live production, playout, and other professional media applications. SMPTE ST 2110 standards make it possible to separately route and break away the essence streams — audio, video, and ancillary data. This advance simplifies, for example, the addition of captions, subtitles, and Teletext, as well as tasks such as the processing of multiple audio languages and types. Each essence flow may be routed separately and brought together again at the endpoint. Each of the component flows — audio, video, and ancillary data (there may be multiple streams of each type) — are synchronized, so the essence streams are co-timed to one another while remaining independent. Dolphin 7.0 is a 24-camera, fully 4K-capable vehicle with the ability to support full 12G workflows. The truck's two Artemis Lights provide Cinevideo clients with two separate fader surfaces (the 56-fader desk provides the main audio feed, with the 24-fader console supplying secondary audio) and two separate audio router cores, guaranteeing full redundancy for a single production or two simultaneous productions. The two router cores share all audio connections via Calrec's Hydra2 network, and the two fader surfaces can be joined to create one huge console for large-scale productions. Technology and production center switzerland ag (tpc) builds one of the first OB vans for IP-based UHD live production worldwide, choosing Sony’s HDC-4300 camera. The multimedia market leader and technical service provider for radio and TV in Switzerland purchased 21 HDC-4300 cameras. The cameras are already in use and were chosen for their reliability and the possibility of producing in 4K when needed. Also compatible with the new UHD OB van are Sony‘s PMW-F55 and PMW-F65 cameras, which tpc is already using. tpc’s „UHD1“ features two high-end 4K IP video switchers, the XVS-8000 and the XVS-6000. The OB van will operate completely IP-based in uncompressed SMPTE ST2110. With all facilities coupled by using a dedicated 100 GigE Fiber connection, the studio and Playout Center is located in Zurich whereas the remote studio is based in Rosssens, in the French-speaking part of Switzerland. German System Integration company Broadcast Solutions is in charge for planning and installation of all broadcast- and IT-infrastructure as well as production furniture. TV-station MySports successfully started producing Swiss Ice-Hockey with a makeshift solution in Rossens, to be later shifted to the final location. "Sky Sport HQ is the realization of our vision for the future of sports production — a facility that offers the perfect combination of high-quality design, state-of-the-art technology, and smart innovation. The scalable MediorNet signal transport and routing system gives us a new dimension of flexibility and sets the stage for us to support IP-based workflows and 4K productions," said Alessandro Reitano, Vice President, Sports Production at Sky Deutschland. "With MediorNet, we can deploy tremendous routing capabilities in a decentralized real-time network that offers powerful flexibility, redundancy, and reliability. Another big MediorNet advantage is the MultiViewer App along with its other built-in signal processing capabilities, which eliminate the need for many external devices." The hubs – located in Sydney and Melbourne – will act as central production facilities. They will be used by Fox Sports Australia for the remote production of over 500 events each year taking place in nearly 30 venues around Australia. The XT4K servers will be implemented into the NEP production hubs to provide full replay solutions within this new decentralized IP-based production model. The XT4K was chosen by NEP Australia because of the IP-focused nature of the overall project. The workflow inside the production hubs will quickly benefit from the server’s built-in native-IP connectivity which enables their implementation into any kind of live production infrastructure. "Implementing tracking technology within our stadia will help to further improve LOTTO Ekstraklasa TV broadcasts and the overall quality of our product. It means that we will be collecting match data at the same level as other top European leagues," said Marcin Animucki, vice president of Ekstraklasa S.A. "Thanks to close cooperation with ChyronHego, the value of our league will increase significantly. This is also important in relation to the sale of our media rights, starting with the 2019/2020 season." He added, "We want to share this data not only in TV broadcasts, but also in media reports, on our online channels, and in the future, on our mobile app." Ideal Systems has conducted extensive field trials for its new Hybrid-IP live sports production system in Singapore. The field trials included producing live match coverage of the recent soccer friendly between Singapore and Hong Kong and as well as Singapore’s Asian Cup qualifier against Turkmenistan for Eleven Sports Singapore. Both matches were streamed live to Eleven Sports Singapore’s Facebook page and have amassed over 170,000 views. The Merlion Cup, sees basketball teams from China, Korea, the Philippines, Chinese Taipei and Indonesia battling it out over five days. On telekomcup.de, users could stream the TELEKOM CUP 2017 live on their smartphone or PC on July 15, 2017, and watch the matches exactly as they would happen on their TV screen. But that’s not all: viewers were also able to switch between the various camera angles in the stadium and sometimes watch unusual and unique perspectives that were not available when watching the game live on TV. There were also the possibility of selecting angles from different stands or even the mascot’s point of view. In the stadium, the life-size mascots made their way around the field and wore wireless body cameras. The Aspen Music Festival and School, for decades the presenters of one of the world’s most renowned orchestral music festivals, celebrates its 68th year in 2017. The just-completed Aspen Music Festival and School (known as “AMFS”) encompasses eight weeks every summer, with multiple venues and more than 400 concert events to delight classical music enthusiasts, many of which are broadcast to audiences worldwide. At such a major music festival, sound quality is paramount, which is why Lawo has chosen to help sponsor the event in years past. Entertainment engineering experts WIcreations has constructed several major set elements and developed associated rigging systems for the spectacular stage architecture designed by Stufish for the Rolling Stones’ ‘No Filter’ European tour. WI’s team was led by Hans Willems and Koen Peeters. Their brief included three major aspects: creating a cantilevered stage roofing system above the main performance area; devising a method for rigging and securing four 23 metre high by 11 metre wide LED video screens to the front of four large steel towers and building two mobile technical areas for use onstage. The annual four day international multi-genre Festival is staged on the site of the former ironworks at Dolní Vítkovice, Ostrava, Czech Republic. The site was inaugurated in 1830 and was a major hub of metal production activity in the area until 1998. It now provides an impressive and highly charismatic backdrop to the event with its unique industrial architecture. The lively festival includes some 20 performance stages with over 350 live music acts, plus discussions, debates, theatre productions, films and workshops, and is enjoyed by around 50,000 people. The all new Ultimatte 12 is more than the world’s best keyer, it’s an advanced real time compositing processor designed for the next generation of broadcast graphics. Ultimatte 12 features entirely new algorithms and color science, incredible edge handling, greater color separation, amazing color fidelity and better spill suppression than ever before. The advanced 12G-SDI design gives Ultimatte 12 customers the flexibility to work in HD today and switch to Ultra HD when they are ready. Ultimatte 12 is available immediately from Blackmagic Design resellers worldwide for US$9,995. The MicroN IP App supports SMPTE ST 2110/AES67-compliant video and audio as well as baseband video (SDI) and audio (MADI). In combination with all the built-in glue features — including audio embedding/de-embedding, frame sync, sample rate conversion, audio/video delay, signal routing, and on-screen display — the MicroN IP App turns the device into a universal tool for all IP-interfacing needs. At the same time, the device can be fully networked with all existing MediorNet products. MicroN IP applications range from a stand-alone SDI-to-IP converter to a fully networked system with numerous different IP gateways and baseband inputs and outputs. Datavideo carries a wide range of handcarry systems. These systems are fully catered production studios that are not larger than a small briefcase. Despite their size they feature functions like dual chromakeyers or an eight channel intercom. With these systems you can produce anywhere and any way you like. HS-2850 is the latest addition to the handcarry family and features 12 inputs. Mixing 3G cameras with regular HD-SDI is no problem due to the built in signal processor. The HS-2850 delivers true control over your production with an eight channel intercom. Sony’s technology will be used to deliver contracts for major sporting events and future-proofs ES Broadcast Hire's offering as more customers make the move to 4K. The investment comes as rental specialists ES Broadcast Hire continues its rapid European expansion, with new offices in Munich and Madrid and a further opening expected in Belgium in late 2017. Headquartered in London, ES Broadcast Hire was the first rental company to invest in Sony’s HDC-4300 in January 2016. It now has the larget fleet of HDC-4300s in Europe, totalling over 140 channels in addition to more than 100 Sony HDC-2500 cameras already in its inventory and a number of HDC-P43s. As part of the collaboration between Panasonic and Berlin Phil Media, Panasonic System Communications Company Europe (PSCEU) planned and built a new UHD-HDR production facility in the Berliner Philharmonie. Panasonic was supported by the Munich based system integrator VIDEOCATION. One of the main challenges was the end-to-end hybrid (UHD-HDR and HD-SDR) production and distribution workflow. In addition to Panasonic studio cameras (AK-UC3000 and AK-UB300), a AV-HS6000 vision mixer is used in combination with a Utah router. Recording, post production and studio playout are handle by a Cinegy system. At IBC2017 Sony unveiled the UHC-8300, its first 8K camera system to include three 1.25-inch 8K sensors. The UHC-8300 was demonstrated at the Sony stand for the first time globally. It opens up the world of 8K with the flexibility to offer customers new capturing technology for shooting in 4K and more. “At Sony, we’re always finding new ways to empower amazing storytelling and to help our customers meet the demand for stunning 4K capture” said Richard Scott, Head of Media Solutions, Sony Professional Solutions Europe. “The unveiling today of the 8K sensor technology offers the capability to capture for 4K production and is a leap forward in imaging technology that will give media companies such flexibility when shooting 4K productions today“.